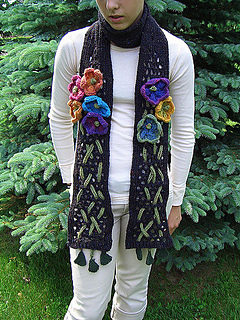 Knit this scarf in black to look like an old iron gate. vine-like stems topped by colorful flowers with leafy fringe at the bottom. You can lengthen or shorten the center ribbed section, depending on if you want it to wrap around your neck (or not), or how many times you want it to wrap. 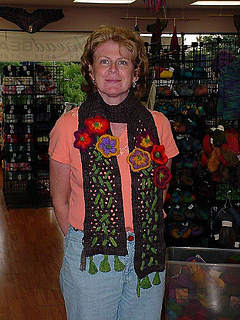 Use a self-striping yarn for the flowers so that the color at the edge blends into another color at the center.